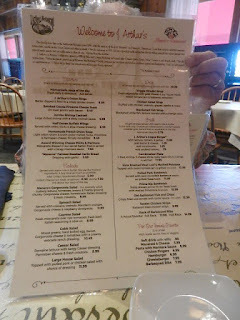 When we decided on Maggie Valley, North Carolina for my birthday vacation I spotted the name J. Arthur’s Restaurant on many restaurant listings. I read reviews and the majority were very positive. I knew that would be my birthday dinner choice! The restaurant was just a few minutes away from our rental cottage. We are ‘early eaters’ and knew the restaurant opens at 4:00, which is good for us. We got there a little after that time and the smells were mouthwatering already! We were seated in the large dining room and our server appeared shortly thereafter. We ordered our drinks, soda for my husband and sweet tea for me. We knew what we wanted and were ready to order! I told my husband I was getting a shrimp cocktail, after all it was my birthday and I deserved a treat! I went with the prime rib with a side of mashed potatoes and asparagus. My husband didn’t order the shrimp cocktail, which surprised me. He ordered the NY strip steak with a baked potato and salad. 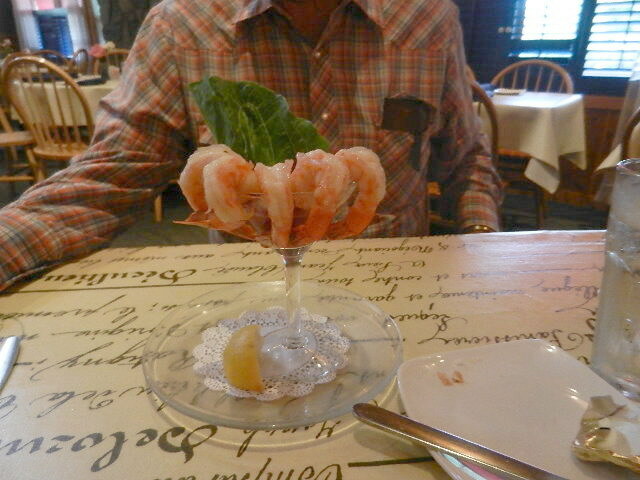 When my shrimp cocktail arrived my husband ‘thought’ we were going to share it – no way! He then ordered his own. The shrimp were huge and their cocktail sauce was out of this world. When they brought his salad out it was enough for two so our server brought a bowl for me so that he and I could share. We were served warm from the oven rolls at that point and then the short wait for our entrees began. My prime rib unfortunately was floating in au jus, which most places serve in a separate dish. I am not a fan of au jus; it’s too salty for me. I cut into the prime rib and the first several bites were very good, tender and flavorful. As time went on and the meat sat it seemed to get a little tough. Or maybe I was just getting full and it seemed that way. I did manage to eat more than half of it. The remainder became a doggie bag for our Ruby and she said it was fine! I probably could have complained about the prime rib, but since it was my birthday dinner I didn’t really feel like getting into anything negative! We had more than enough food so no desserts for us. I didn’t even ask what they had but I bet it was good. The restaurant was empty when we arrived, but by the time we left it had filled up nicely. It was fairly quiet even though it is a big room. While the majority of the customers were seniors, there were a few younger couples and even a few motorcycle folks. 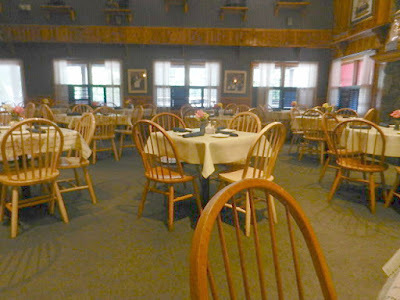 The food overall was excellent, the ambiance excellent and the service excellent. 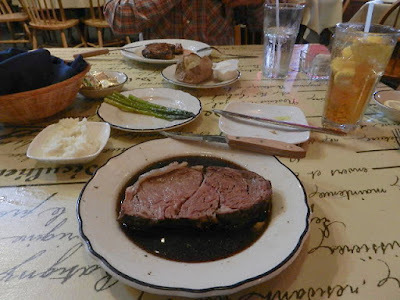 If we are ever back in Maggie Valley, North Carolina we certainly would revisit J. Arthur's Restaurant. I would, however, order the steak! You can check out their menu and other information at their website - click here!